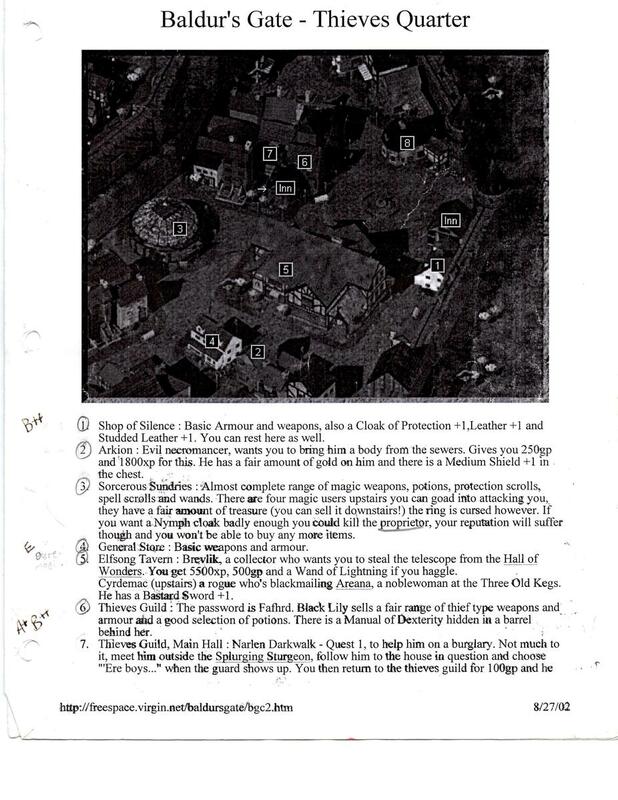 Back in 2002, my dad printed off a guide to the city maps of Baldur's Gate which included a map of each area marked with numbers and points of interest, and below it a list & description of what the marked locations were, as well as NPCs and quests related to that location. In all my years of playing the BG series, I have found this guide to be unequaled in its quality, ease of use, usefulness, and format. There have been many similar (but IMO lesser) guides over the years, but this one is by far my favorite. It has been a wonderful resource as both a player and modder. Sadly, my pages are getting quite warn and marked with use, and I'd like to find a fresh copy of the originals, but so far I have had no luck. The domain where I first got them was http://freespace.vir...et/baldursgate/, but it seems that site no longer exists. Searching on WayBack Machine yields http://web.archive.o...et/baldursgate/, but the maps aren't there. Does anyone happen to know the ones I'm talking about, or more importantly know where they can be found now? http://web.archive.o...maps/themap.htm Old Cyberjag site at Archive? Her skin was white as leprosy. http://web.archive.o...ex.com/m.james/ You just have to know your way around Archive. I found some of the maps here. Its a shame a lot of these old sites are gone. This one looks beautifully made and informative. Edited by Solaufein, 11 April 2012 - 06:11 PM. http://wayback.archi...ex.com/m.james/ This has all the dates this site has been captured. With luck you may find all of the images. Were you only wanting the city? some of the other locations have maps too. I went ahead and made pdfs of all the other complete maps. I retitled the pages to match the map here. However, I can't upload files here it seems. So if someone who can would like to move them from off my website and make them available, that's fine by me. I was unable to find any more complete pages with maps. The Nashkel Mines was missing one of the hand drawn graphics so I left it out. an AI Party Script for BG2 game engine DOWNLOAD LINK ONLY! Interactive Tweaks for BG series with some IWD support. DOWNLOAD LINK ONLY! Try this http://wayback.archi...x.com/m.james/* Putting an * between the url will give you everything associated with a capture. It will save you t he time of going through year by year. I have recreated/rebuilt the walkthrough for the Baldur's Gate city maps. They are in HTML format, and are the same as the originals, but with a couple of basic corrections. If anyone is interested in remaking the walkthrough in full from the old site, I'll explain the best way to save the pages from Wayback Machine, I'll generate all the maps for you, and send you the generated black and red numbers. All you'd have to do is save the pages from Wayback, and add the numbers to the proper locations on the maps. I started the process of recreating the old site, which would be followed by updating it to reflect the latest version of Baldur's Gate: Enhanced Edition, but have quickly realized just how much work (and time) this will take. Personally, I like the layout and design of this guide/walkthrough very much, but I'm wondering what the level of interest is in seeing it restored? I've played the game enough times that the Baldur's Gate city maps are the only ones I find useful, but if others would find the entire guide helpful, I'll probably remake the whole thing. Is this guide even unique enough to be useful, or are the existing guides/walkthroughs (like the one at Dudleyville) sufficient? Restore it. I hate seeing the old sites become lost and gone forever. It had a nice layout and information. It should be brought back to life. What I have so far. I use (and thus have tested it in) the latest version of Firefox. I am willing to put forth an effort to support the latest versions of Opera and perhaps Chrome, so if anyone notices anything displaying wonky in those browsers, let me know and I'll see what I can do. If you use Internet Explorer, it's time to put on your big boy/girl pants and start using a real web browser . Looks nice. It takes a while to rebuild an old site back to its former glory.